Featuring two intertwined hearts, this brooch is probably a piece of luckenbooth jewellery from Scotland.Luckenbooth jewellery has been around since the 17th century. This piece is Victorian. 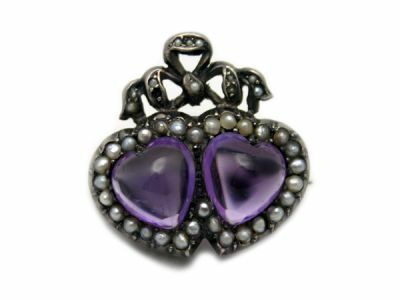 Each heart is made of polished cabochon amethysts. Surrounding the amethysts are split pearls. A bow with more inlaid pearls sits on top of the two hearts. The whole piece is set with .900 grade silver. This would make a very romantic gift.